We all know that the Taiwanese company HTC is going through the difficult times. But, its rumored device HTC 11 which is said to have very interesting features could really change its situation and fulfill its crisis. HTC is going through the difficult times. The Taiwanese company has experienced years in which its various models of smartphones enjoyed wide acceptance among users and their sales figures were very significant. However, for years, the mobile phone division of the company has failed to adapt to new market trends, especially in terms of design. This, coupled with a policy of too high for the specifications offered prices, has led to the popularity of the company among users has declined to very low levels. But this does not mean it is the end of HTC. Several company executives have announced in their social networks “Will not give up” and think that they have a plan to overcome this crisis. Within this plan, HTC decided to launch a new brand new device to grab the attention of users. 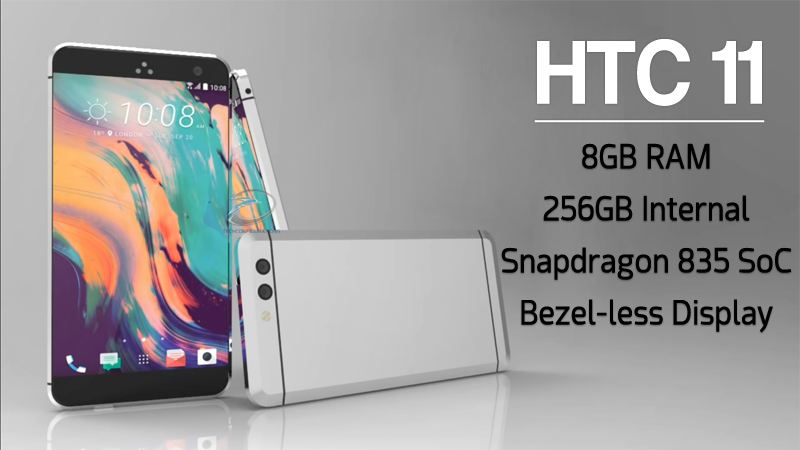 To achieve this, the Taiwanese company HTC wants to bet again on its high-end devices. They have already tried in the mid-high range with models like the HTC Evo 10, without getting to achieve good sales. So they are now willing to wager everything on a pointer device specifications. We are talking about the HTC future 11. According to information from reliable sources, this new phone will have the first level of internal specifications. Inside we would have the latest model of Qualcomm processors, the 835, thus becoming one of the first phones to mount that processor. As for RAM, 8GB would have an incredible amount in the case of a mobile phone. The combination of processor and RAM should give optimal performance to the device. In the photographic section, it will come with the rear camera of 12-megapixels and a front 8-megapixels. Moreover, the device will also come with a huge battery of 3700 mAh along with the Quick Charge 4.0, it will provide the device system much autonomy, plus a very low load time. As for the internal storage, it seems that we could have a model of 256GB memory. Moreover, the future HTC 11 is expected to run the latest Android 7.0 Nougat along with the HTC Sense 8 UI. While, according to the Phone Arena, when it comes to design, HTC 11 is rumored to have a bezel-less screen following the trend set by the South Korean giant Samsung on their curved and bezel-less 2016 premium handset Galaxy S7. So, after having a look at impressive specs and features mentioned above, you can expect the price range, yes, the HTC 11 is rumored to have a price tag that may start at $691. But, hold on, we should remember that, for the moment, they are just rumors and we have to wait for the phone to confirm presentation. However, the smartphone is said to be launched in February 2017 during the MWC (Mobile World Congress), following the trend of HTC when launching their newest smartphones yearly.